Rivertown | Beer Apprentice - Craft Beer News, Reviews, Interviews and Info. How’s it going guys? 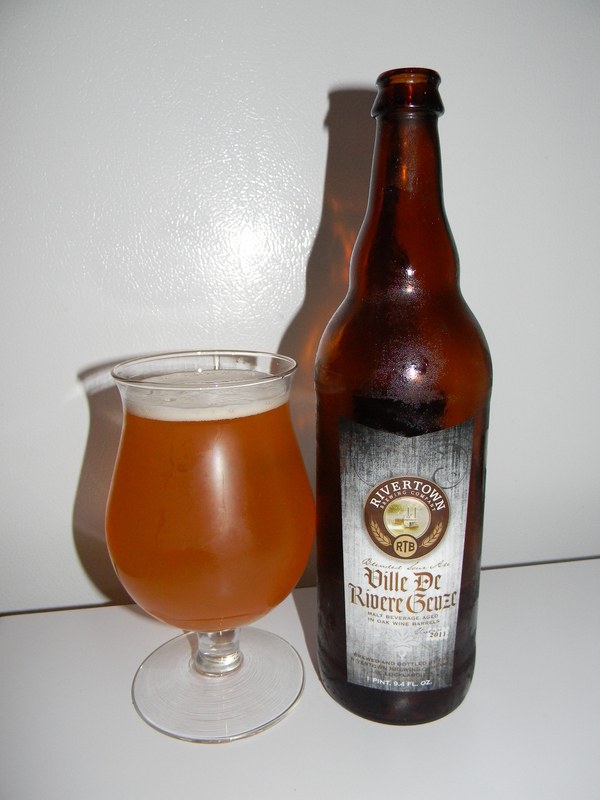 For today’s craft beer review I’m going to be trying the Ville de Rivere Geuze (2011) produced by the Rivertown Brewing Company located in Cincinnati, Ohio. I’ve only had the opportunity to try a couple of brews from Rivertown and they have been solid enough, so I’m hoping that this brew holds true to my previous experiences. Let’s get to the website, rivertownbrewery.com, and see what we can find out about this beverage. – Available in 750ml bottle only, released once yearly in October. A blend of our 8 month old and 3 year old lambic beers. A prized possession – dry, spritzy, sweet and sour, vinous and earthy. Ok. Let’s get at it!!! This beer came in a 25.4 oz. bottle and at 6.4% ABV. It poured a hazy, orange color. The head was white, but rather small even with an extremely aggressive pour. It hardly had any retention time or lacing. Very flat to be truthful. The nose released a decent bit of sourness. It fell along the lines of lemon citrus, white grape and green apple. A subtle amount of woodiness and a minor amount of musty hay and funk were discovered as well. Overall, I felt that the aroma was just a touch underscored. I would have liked for it to have a little more punch. The flavor discharged an ok amount of sourness and acidity. Again, mostly lemony and white wine like grapes. It also had a slight grassy savor. The woodiness was decent enough, but the funk was rather weak. The mouthfeel was medium bodied. Dry, semi-sharp, but mostly smooth. The carbonation fell to the low side, yet an ok amount of flavor was left behind for me to ponder for a few moments before I took another sip. Well, this was an ok beer i guess. Truthfully though, I was a bit disappointed. It was just too mellow for me, especially with a beer of this style. It may just have been past its prime or something. Coupled with the fact that it was incredibly flat. The drinkability was pretty good though. I had no trouble finishing the whole bottle by myself. I’d really like to find a fresh bottle and see how it is. Either way, if you guys have the opportunity to try the Rivertown Ville de Rivere Geuze…. let me know what you think. I’d be interested in hearing another opinion. Hi guys. It’s time for another craft beer review and today I’m going to be trying the Old Sour Cherry Porter produced by the Rivertown Brewing Company situated in the Queen City of Cincinnati, Ohio. I’m really looking forward to trying this beer, so let’s jump over to the website, rivertownbrewery.com, and see what the commercial description tells us about it. Available in 22 ounce bottles only and released in early spring 2013. Imperial porter aged in bourbon barrels with dark Michigan cherries and lactobacillus delbrueckii (a Belgian souring bacteria). It poured black in color with only the most faint deep ruby hue around the curves of the snifter. It had a small tan head that was smooth, semi-fizzy and soft. The retention time was ok and a decent amount of lacing lasted for a few moments too. After the foam completely subsided, I did notice some clear alcohol legs when I titled the liquid from side to side. Wow!!! The aroma was spectacular. Beautiful notes of soured cherries and dark grapes. It was tart with a slight vinegar redolence. It also presented an underlying combination of woody vanilla and booze. A definite red wine characteristic couldn’t be denied. I loved the smell of this thing. So balanced and complex at the same time. The booze became a little more forceful within the taste. More of a Bourbon characteristic actually. More of the pleasant wood and vanilla as well, which was fine by me. The soured cherries and grapes were a nice compliment to the strong alcohol. To tell the truth, the booze really started to settle and become more harmonious as it warmed and was allowed to breathe. At the very back end I detected the faintest bit of “earth”. That was somewhat surprising, however it did nothing to distract or harm the overall flavor. The mouthfeel was medium/full bodied. Very smooth, dry, chewy and slick. The carbonation leaned toward the lower side. An awesome dose of warmth was felt deep into the chest and after each swallow a ton of flavor was left on the palate for me to enjoy between sips. Well, I thought this was a great beer. Don’t hesitate to pick it up if you see it somewhere. It’s chocked full of personality and flavor. It’s bold and forceful, yet delicate enough for a session. I sure hope I can find another bottle myself. I’d love to age one of these for a year or two to see how it would develop. I’d bet that it would become even more complex with time. So, if you guys happen to try the Rivertown Old Sour Cherry Porter let me know what you think. I hope that you like it as much as I did. Hello everyone. Thanks for checking back in on another craft beer review. For today’s review I’m going to be trying the Hop Bomber produced by the Rivertown Brewing Company located in the Queen City of Cincinnati, Ohio. We have just recently started receiving Rivertown brews in my area, so this will be my first experience with one of their concoctions. Let’s jump over to their website, rivertownbrewery.com, and see what the commercial description has to say. An American pale ale named after the famous B-24 Liberator Bomber. This beer has a wonderful malt backbone from the use of dark British crystal malt and spicy fresh rye malt. It is dry hopped with two varieties of American hops for a crisp refreshing flavor. Alright. I’m getting thirsty. Let’s pour this thing. It poured a semi-hazy, orangish to amber color. A well sized, off white head was formed from an easy cascade. The texture was soft, sort of rocky and fluffy. The retention time was admirable and the retention time was patchy, but attractive enough. The nose brought forth a nice caramel malt to begin with. Additional hints of toasted biscuits along with floral and earthy hops came about next. A sturdy waft of wheat and/or rye bread added even more “roundness”. A very, very light hint of apple and orange added some complexity, however this was very much a “malt forward” fragrance. The flavor had a bit more of a grainy type profile. It still had plenty of that earthiness, caramel malt and rye bread goodness though. The fruity apple and orange characteristics that were discovered in the smell were almost nonexistent in the taste. Oh well. It was still enjoyable. The mouthfeel was medium bodied. Smooth, semi-dry and slightly chewy. The carbonation was of medium strength and an ok amount of flavor was left behind after each swallow. Overall, I thought this to be a solid beer and worth a try if you can obtain it. I doubt that it will knock your socks off, but I believe that it would be an excellent drink for the Fall season. It’s definitely not a “hop bomb” as the label suggests that it might be. It’s very malt forward, but that’s alright. It’s an easy drink that could be enjoyed without much fanfare or contemplation…. or it could be studied if need be. Either way, the drinkabilty is quite good and I wouldn’t mind having it again sometime. 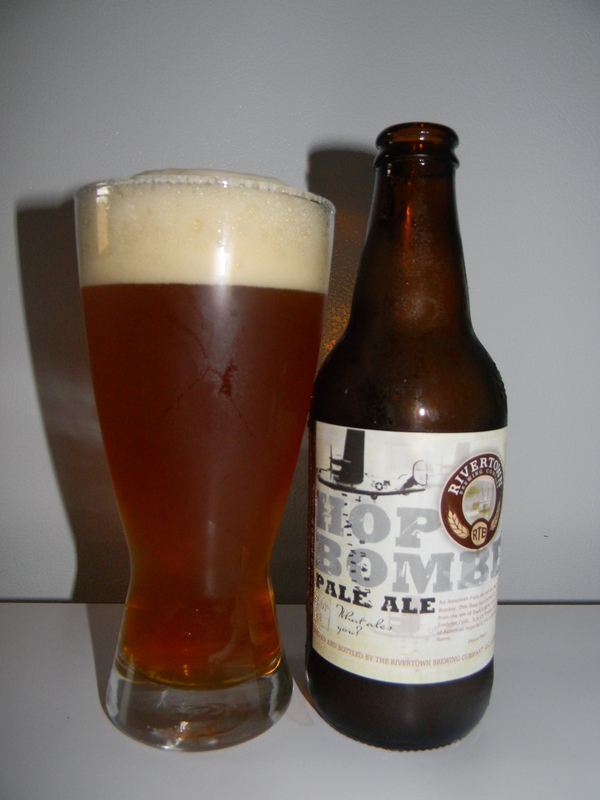 So, if you guys get to try the Rivertown Hop Bomber, drop me a line and tell me of your opinion. I’d love to hear from you.